Shop -- Closeout on legacy logo items - Get them now! - Once they're gone, THEY'RE GONE!!! 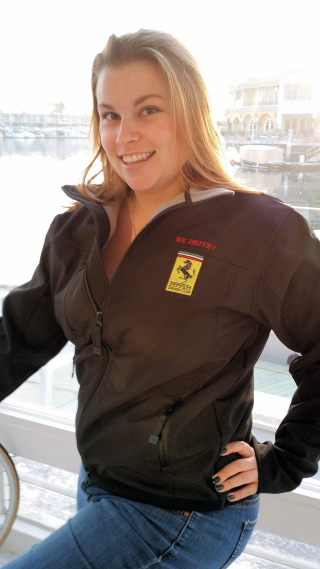 One size fits all hat proudly displaying the Ferrari Owners Club logo on the front and the Cavallino Rampante on the back. The Ferrari Owners Club logo surrounds the lanyard and the quick-connect clip allows easy access to your items. Proudly display your Ferrari Owners Club affiliation with these stickers. Available in black, the fleece lining insures warmth. Pockets offer convenient storage. Zipper works from the top and bottom for easy access to pants pockets. To commemorate the 70th anniversary of Ferrari, this t-shirt was created to display several iconic Ferraris through 70 years of producing their iconic cars. These shirts are limited, so get yours today! Ferrari Owners Club members get a 20% on Ferrari Puma items, be sure to enter promotion code ferrari2005 during checkout. Click here to shop those items. Note: you will be directed to a different site.